TRIMS will collect and store hourly and daily weather summary information. 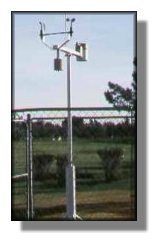 TRIMS Weather Station Communication program can chart manually entered data or data captured from automatic recording weather stations. Line graphics illustrating daily or monthly weather summaries are created from information contained in the Weather Data Base.